Purchase it online now or use our mail-in Order Form. These books are constanty updated througout the riding season. No big pre-productions here, each book is created on-demand. See the current trail updates in our GPS Map History to see which trails are being added/changed. 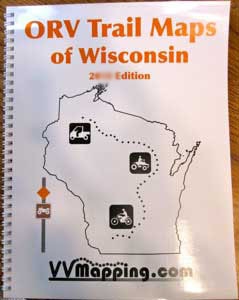 The Wisconsin Off-Road Vehicle Trail system is included in it's entirety. Over 12000 miles of Trails & Routes! Each trail has been documented with a GPS unit, more accurate than any other product we know of. Trails visually differentiated between ORV, Motorcycle-Only and ORV Route. Book is wire bound for convenience and durability. Over 100 pages of full color detail. Size is 8.5" x 11" - easily take it on the trail with you! 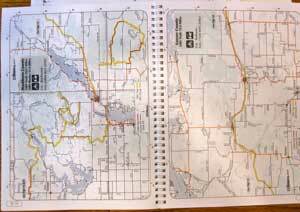 ORV Trails and Routes shown and easily identified. Public land ownership is included. County roads, state highways, forest roads and more. Parking lots are included, with GPS coordinates. Nearby gas stations and campgrounds. Distance between trail intersections, trail intersection numbers and more. Details on ORV rules included. 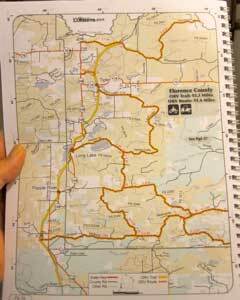 An integrated Trail Guide covers each trail. The Guide includes descriptions of each trail. This compliments our GPS ORV Trail Map product very nicely. Use the GPS to know exactly where you are and the mapbook for the "big picture".